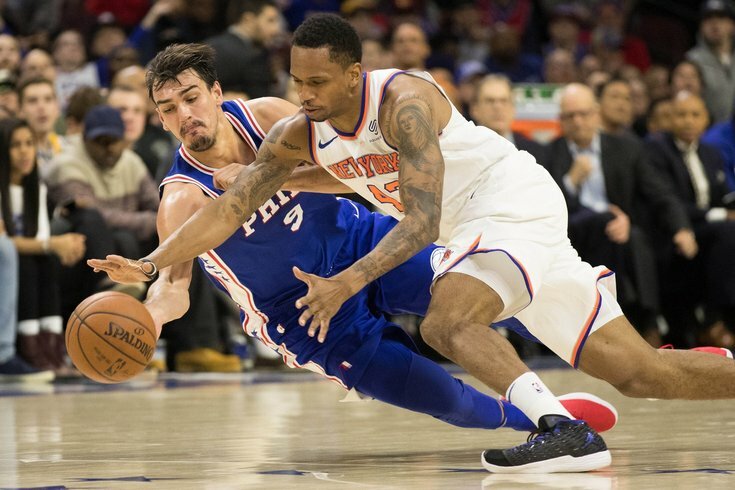 Philadelphia 76ers forward Dario Saric and New York Knicks forward Lance Thomas dive for a loose ball during the second quarter at Wells Fargo Center. The Sixers are the middle of a run against mostly bad teams, which has fueled their ascent toward the No. 3 seed in the Eastern Conference. This late in the year, there are basically only two goals in games against teams with no real chance of beating you: get the win, and stay healthy. Philadelphia came away with the former in a comfortable 118-101 win over the Knicks, but they did not manage the latter, and Joel Embiid suffered a blow that left a lot of fans sleepless on Wednesday night. With just under 20 seconds gone in the second quarter, Embiid and Markelle Fultz attempted to run a simple dribble handoff to get their offense going. The big man fumbled the ball, and in his effort to retrieve it before the Knicks could get out and run the other way, he was met by Fultz's body. Things got real quiet around the Wells Fargo Center as the big man writhed in pain on the ground, and his ginger walk to the locker room provoked a sigh of relief from the entire arena. Updates were provided in a drip feed the rest of the night, but the ultimate prognosis was still up in the air as the Delaware Valley woke up Thursday morning. X-rays were negative, and initial concussion tests done on site ruled that he did not have a concussion, but he was held out of the rest of the game anyway and sent to a local hospital for further precautionary tests. There was cautious optimism from the Sixers players after the game, including from the guy who ran into him in the first place. "I'm really worried about him," said Fultz after the game. "I was trying to get the ball at the same time I was watching him. My heart dropped really, because I know he hit me, but he's a tough guy and I know he's going to be okay." That will almost certainly be the case long-term, but the Sixers had to make due without their big man for at least one night, which was another good learning experience for the group. "It's a good win, people wouldn't feel maybe because of the record that the comment is entirely true. I do," said Brett Brown, citing the absence of both Embiid and his primary backup, Amir Johnson. "You do it by committee, you do it by a team, and you buy some time until somebody says Joel can return to play." There are so many superlatives to describe Dario Saric with. The second-year forward is competitive, intelligent, and skilled to a degree that belies his size. But all of those things add up to the thing that is the truest about Saric: he is a winner. After Embiid went down, a decent-sized lead evaporated for Philadelphia, and every sign seemed to be pointing to a gruesome performance in his absence. As if he possessed a sixth sense, Saric flipped the energy in the building with a hustle play that ended in a ferocious dunk for Ben Simmons, sending the arena into hysterics. That only goes down as one assist in the box score, but the spiritual lift it gave the Sixers was undeniable. Heading into halftime with the wind in their sails, the Sixers came back out in the second half and squashed the New York threat. "Fantastic," said Brown. "Truly inspirational stuff. That's what we want to be, for the most part, I think that's who we are. That was a courageous play, a motivating play, [and] he I thought tonight was our MVP ... that play is as good as it gets if you just wanted a snapshot of how you want your team to be perceived. It speaks volumes on many levels." Without Embiid, the Sixers needed someone to take on the primary scoring load. Saric did that and then some, offering 26 points, 14 rebounds, and five assists in an effort that could only be described as relentless. Philadelphia's starting five has really only worked because of the improvements made by Saric. If not for his leap forward as a shooter, their team composition would have been dead in the water. But Saric has not only improved, he has turned himself into one of the best volume shooters in the NBA, a testament to the work he has put in at the practice facility. Aesthetically, nothing Saric does looks like it should work. You can see the instincts are there and then some, but his lack of burst allows defenders to catch up to him and make life miserable when he gets close to the basket. But Saric's life as a basketball player has always been this way, so he pokes and prods until an opening reveals itself, however slim it may be. Ever the showman, Saric saved his best contribution for postgame availability. Prior to the contest, Brett Brown told reporters that there's not a single team in the Eastern Conference he fears, because the Sixers have competed with and/or beaten every top team in front of them. Saric was asked about the idea after the game, and he let everyone know there's still a bit of appropriate fear within him while looking at a four-time MVP. "I don't know, I don't want to play against LeBron James," said Saric. "He's top-three players in the history of the NBA. Play against him, he is like [eyebrow raise], playoff is different. But I think other teams, [I'd] more than welcome them on our court." We try to play very good defense and offense, I think we can beat everybody, for sure everybody." Like I said Wednesday — you want to avoid Playoff LeBron as long as possible. With the stakes of the all-important first game back behind him, there was a lot less pressure on Markelle Fultz to perform against the Knicks. Don't tell that to any of the fans who showed up to the game, because they showered him with loud ovations each time he checked in and out of the game on Wednesday night. On the positive side of the ledger, Fultz continued to take care of the basketball in his limited minutes, piling up another seven assists without a single turnover to show for it. That brings him up to 15 assists against just one turnover since returning, an exemplary mark for a rookie guard being thrown back into the fire. That alone has been a big reason Philadelphia's unit has been humming with Fultz running the show. The assist part of the equation probably overstates his impact as a passer so far — a lot of his assists have come through really tough shotmaking from his running mates — but the offense has run naturally despite his final hour inclusion in the rotation. It's a win for Fultz and the team regardless of what the box score says. And you can see the difference in how teams respect Fultz as a scorer vs. how they approach defense when T.J. McConnell is helming the second unit. New York collapsed on drives for Fultz several times in his limited minutes, and he has the vision to find open teammates once those breakdowns happen. But that brings us to a problem Fultz had against New York, which is a continuation of something he struggled with early in the season. He has struggled mightily at finishing in traffic, and it's pretty clear he isn't used to dealing with NBA length and physicality yet. This is to be expected, especially with his jumper being such a work in progress. He was not an elite finisher at the rim in college, converting 61.6 percent of his shots there while at the University of Washington. The difference between his time there and his time in the NBA is the shot distribution. Looks at the rim were only 25.5 percent of his attempts as a freshman, while shots from five feet and in currently represent over 44 percent of his attempts. The sample size is minuscule, but given his reluctance to shoot outside jumpers it's a trend that's likely to persist for the time being. If you're looking for a silver lining, he is at least inviting contact on his drives. Given his struggles at the free-throw line when we last saw him in October, watching him take it to the chest of opposing big men is a welcome sight. Those journeys toward the hoop ultimately earned him a single pair of free throws late in the third quarter, and he split them. The form wasn't beautiful and still featured a hitch, but it was a drastic improvement from anything we saw early in the season. That first normal-ish trip to the line is really important because it checks off another box for a kid reacclimating to the grind. He said as much when asked about it after the game, downplaying the significance as just part of the process. "It felt great really, I've been doing a lot of practice at shooting free throws," said Fultz. "I felt confident going there, I made the first one and missed the second one, but it felt good." As you might have expected, Fultz was the big topic during Brett Brown's pregame availability on Wednesday evening, with the coach fielding all sorts of questions about his pupil's performance and the various means of evaluation they'll use to determine his role. The interesting thing for me when Markelle and I spoke before I shared that news with you all at this time the other night, I asked him, what's your greatest concern? He didn't flinch, he didn't blink, he said I don't want to hurt the team. I understand it's game 70-whatever, I understand it's March. And that judgment is on me, and as I said, the risk vs. the reward, all day every day I was ready to live with. That dynamic says a lot about Fultz and Brown as people. It takes character for a 19-year old itching to return and dealing with insane media scrutiny to think of his team first, and it takes a leader for a coach to inject uncertainty into his rotation this late in the year. Being behind closed doors and listening and learning and just sort of feeling the person, you recognize quickly he's an elite human being. He's really, sincerely a genuinely good person. He doesn't look at himself sometimes, I think, as the best player in America, as the No. 1 pick. I say that with complete respect — there is a humility, there is a self-awareness, those two personal qualities interest me in kind of everybody ... he's good people and I'm proud of him. As I wrote when I laid out much of what I know about the story behind Fultz, the people around him go to bat for him at each and every opportunity. If you're looking to bet on someone who could pull out of the spiral he was in, that's the sort of human being you place your money on. Maybe this doesn't deserve an entire bolded section, but when you do observations for 82 games a year, you're allowed to make your own rules. Just another near triple-double (13 points, eight rebounds, and 10 assists on 6/7 from the field) for Simmons, just on pace for a 15-8-8 season in his rookie year, a feat no one has achieved aside from the great Oscar Robertson. No big deal. If Embiid misses any time, they will need Simmons to step up and focus on scoring more. Just remember it's okay to enjoy the flash and flare sometimes and not worry so much about what his future trajectory is.